MOSCOW — A government plan to increase the age for collecting state pensions brought protests across Russia’s 11 time zones Sunday even though the opposition leader who called them was in jail. More than 1,000 people were reportedly detained. The plan calls for the eligibility age for retirement pensions to be raised by five years, to 65 for men and 60 for women. Opposition to it spans the political spectrum. 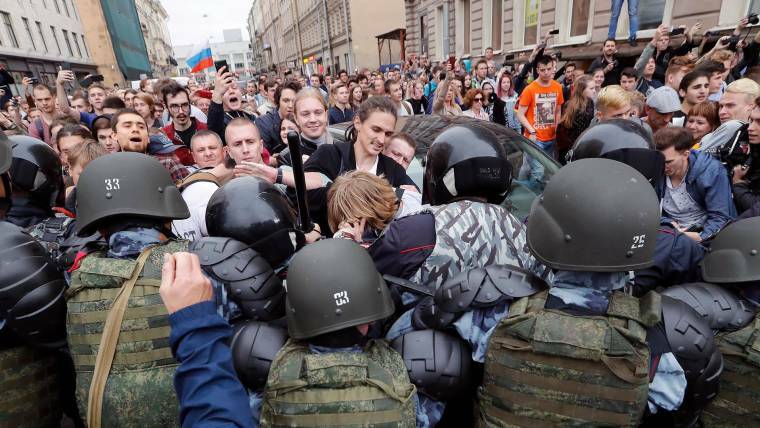 The rallies got started in the Far East and Siberia when it still was early morning in Moscow, where a downtown demonstration in the afternoon ended in scuffles when riot police stopped participants from marching to the Kremlin. Alexei Navalny, the anti-corruption activist who is President Vladimir Putin’s most prominent foe, urged supporters to protest the pension proposal Sunday before he was sentenced to 30 days in jail for organizing an unsanctioned January protest involving a different issue. Demonstrations took place throughout the sprawling country, from Yuzhno-Sakhalinsk on a Pacific island and in Kaliningrad, the Russian exclave between Poland and Lithuania. The OVD-Info organization that monitors political repression reported that as of Monday morning more than 1,000 people were detained in connection with the protests around the country. That figure included 452 which occurred in St. Petersburg, OVD-Info said. Factory worker Olga Sokolova, 52, said she was “dumbfounded” when the proposal was introduced in June because she had hoped to retire from her physically taxing job at age 55. “I can’t keep being afraid anymore,” she said of her decision to risk detention by showing up at Moscow’s Pushkin Square for the protest that attracted several thousand people. They later marched toward Red Square and the Kremlin, chanting “Down with the czar!” as they passed the building of the Federation Council, the upper house of parliament, and leisurely Muscovites enjoying a hot afternoon. The group was eventually blocked by police barricades. Riot police observing from the sidelines charged the marchers with raised batons when some tried to rush through the barriers. The crowd dispersed half an hour later. Raising the pension age is opposed both by older Russians, who fear they won’t live long enough to collect significant benefits, and by young adults worried that keeping people in the workforce longer will limit their own employment opportunities. “The reform is a robbery of my parents and grandparents. We’re stealing our future, too. 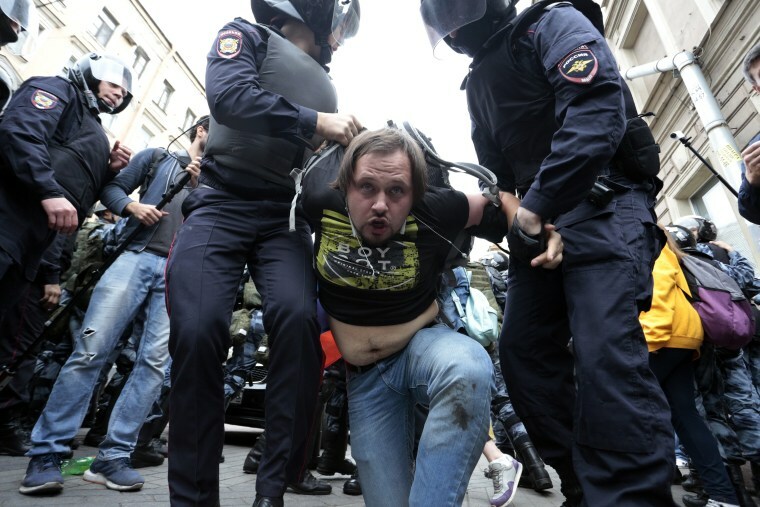 Right now the only thing we can do is protest,” 24-year-old Igor Panov said at the Moscow demonstration. 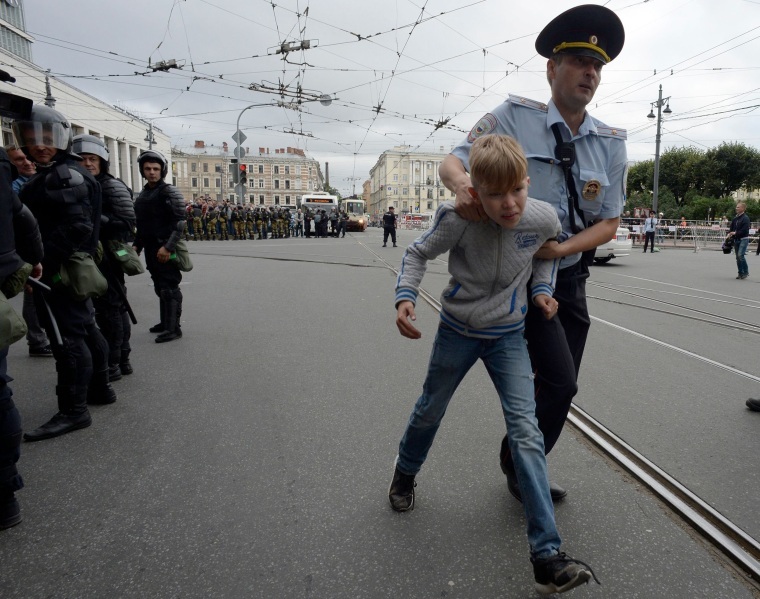 “The state should have found the money it needed in the budget or through fighting corruption,” 19-year-old Yegor Zhukov said at the St. Petersburg protest. Popular opposition leader Yevgeny Roizman, who is a former mayor of Yekaterinburg, said on Twitter that a younger generation took the lead because middle-aged Russians were too scared to protest. Putin’s trust rating in public opinion polls dropped after the proposal was put forward. Last month he offered some concessions, but he and government officials say the age hike is necessary because rising life expectancy in Russia could exhaust pension resources if the eligibility age remains the same. The proposed changes offered by Putin are to be considered when the bill comes up for its second reading in the Duma, the lower house of parliament.